Teslin is a small village located along banks of Teslin Lake and Nitsulin Bay. It was a traditional meeting place and summer camp of the Tlingit people for thousands of years, until gold prospectors arrived and established a settlement en route to the Klondike. The townsite grew as a result of the presence of the Hudson’s Bay Company, the Northwest Mounted Police, and an Anglican mission. 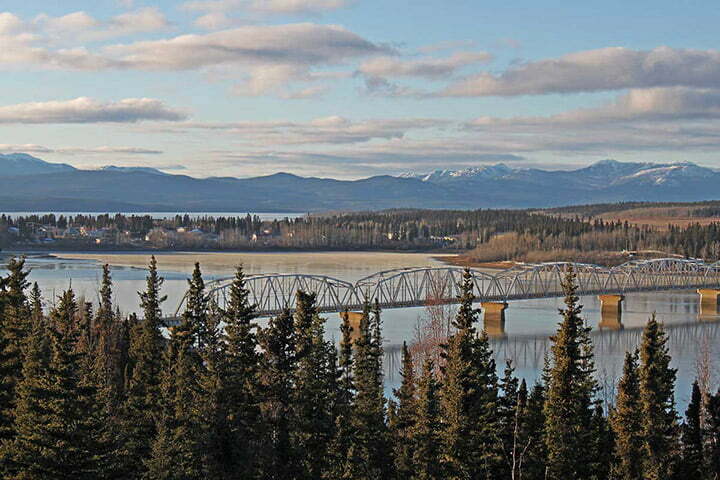 Today, Teslin is home to approximately 470 residents who enjoy a prosperous community with modern amenities, as well as the many resources provided by Teslin Lake and the nearby rivers. In late summer, Chinook and Chum salmon travel up the Yukon and then the Teslin Rivers to spawn. Autumn brings many hunters to this area for ducks, geese, and moose. A public boat ramp and launch are situated on the north side of the Nisutlin Bridge, which is the longest bridge along the Alaska Highway. The "Northern Wildlife Gallery" offers visitors a rare look at many species from the remote corners of this vast land. The specimens displayed met an untimely end through natural causes or contact and were donated for taxidermy for this exhibit. The wildlife gallery strives to provide knowledge and understanding that will allow northerners to continue to live in harmony with Yukon wildlife. Admission is free.